christmas – time of the „stuffed“ duck? deutsch: gefüllte ente zu weihnachten? I don’t want to spoil the Christmas Roast for anybody. Enjoy it! But, what are the requirements, to be able to really savour a roasted duck? How do you fancy “your” duck? Gabbling, plucking out some blades of grass and flapping their wings to impress their duck-mates. Tight wire cages with wire floor. 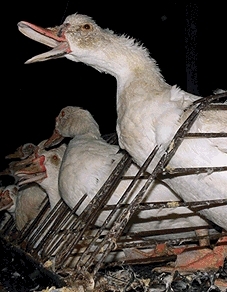 Ducks in solitary confinement, unable to move, unable to spread their wings, unable to stand up or sit comfortably down. No grass. No sunlight. No movement possible. Only distraction: Twice a day a long and hard tube down the throat and 800 g of food pulp pressed directly into the stomach. In a matter of seconds. Injured and ulcerous feet: under them: wire mesh. A heavy liver: pressing on the lung: laboured breathing: no power to gabble. In a room full of thousands of ducks: No gabbling. No power. „What do you want from me?" some will say. "Of course, I do not buy liver from stuffed ducks!" 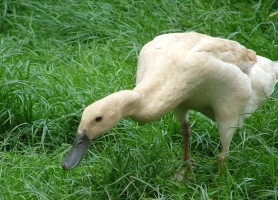 But, lo and behold: A duck is more than just a fat liver! Besides incrusted eyes, ulcerous feet and broken wings there is delicious breast and joints. And of course the whole disembowelled ducks are found in the supermarkets, too. Here. In Germany! Do not buy such ducks! But, how to tell whether the duck you want to buy comes from such a stuffing farm? Most easy thing: Go to the organic farmer or shop. 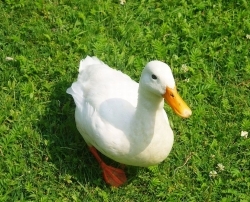 But for those, who can’t find such a farmer or shop, or who thinks his stomach and purse are more important than the healthiness and happiness of a duck, for those, there is a third way: Look for the EWG-numbers. On every factory sealed duck in the refrigerated section in the supermarket there should be such a number. 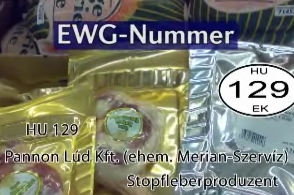 With the help of this number and the "Schwarze Liste" of the Animal Rights Organisation Vier-Pfoten you can look for the ducks not to buy: Every farm listed on the "Schwarze Liste" is a farm which uses the stuffing technique. In Europe it is only allowed to use this technique in Hungary and France. But: It is allowed to sell those products in the rest of Europe. And tell your parents, if they are the people to buy your Christmas Duck. And friends, colleagues, other people. This is the reason, why I also sent this to my vegetarian and vegan friends, who do not have to watch the film, found on the homepage of Vier-Pfoten. All the others should clench their teeth and watch it: Here is the film. It’s in German, but the pictures are nearly telling the whole story.